When I was growing up in the wilds of Northern Virginia, I ran with kind of a hip crowd. My friends were Betty, Veronica, Reggie, Archie, and a guy we called Jughead. We were mostly good kids; sure we got into a little trouble at Pop’s Chok’lit Shoppe from time to time, but just for goofing. We even got to know some rocker chicks, Josie and the Pussycats! OK, so maybe that wasn’t my crowd. But it totally could have been. And when I was reading my Archie comics I felt immersed in that world. We’ve all grown up, but the idyllic characters of our youth should be frozen in time; forever young. Well now my bubble has been burst, because, Archie is soon to be dead. Yep. Dead. And not just dead, but violently taken out; gory blood and guts and all. What the hell kind of thing is this to drop on us? Is nothing sacred? 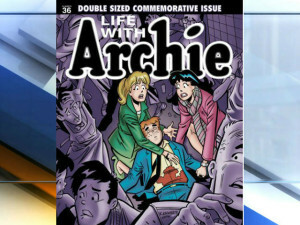 Courtesy of Archie Comics, Inc.
Conveniently enough, Archie is getting killed off in a series about the future. That way they can still milk years and years out of his character before throwing in the towel for real. Or they might take their cue from daytime TV and decide that the whole thing was a dream sequence. Regardless, I couldn’t help but start thinking about the whereabouts of my other beloved childhood comic book and cartoon characters. Of course, we’ve all heard the sad news about Richie Rich. Lost it all when the economy tanked in 2008. He was forced to move in to Cadbury’s tiny flat in a seedy neighborhood in London. The Jetsons? It took a little googling, but it turns out that Elroy is a CPA. George and Jane are retired and enjoying life in Assisted Space Living. Rosie, sadly, rusted away. Don’t ask about daughter Judy. We don’t like to talk about it. In other news, I discovered that Fat Albert had lap band surgery and launched his own line of exercise equipment; a fitness mogul as it were. Mushmouth has been working with a speech therapist and his elocution is now perfect. Dennis the Menace finally married Margaret, straightened up, and flew right. Rocky and Bullwinkle are thrilled that thanks to groups like the ACLU and HRC, they are allowed to legally marry. Boris and Natasha were too busy in Crimea to try and disrupt the wedding. Kimba the White Lion is spending her twilight years in a wildlife refuge in Africa. Casper, always a friendly ghost back in his day, has become rather ornery in his old age. He was caught recently skulking around scaring small children. It’s sad, really. And Scooby Doo, well, let’s just say he’s living on a farm in upstate New York, where he can run free with Deputy Dawg and Underdog. This entry was posted in Uncategorized and tagged Celebrity, Childhood, Culture, Drama, Imagination. Bookmark the permalink. Yep, they went all Hollywood and forgot about the little people back in Riverdale.